With more diabetic patients at risk of losing their sight to preventable eye disease, doctors and the health authorities are scaling up screening efforts, hoping to catch abnormalities before they get the chance to wreak havoc. About 150,000 diabetics had eye screening in the public sector in 2016, up from 131,000 in 2015 and 121,000 in 2014, said the Ministry of Health (MOH). There are more than 400,000 diabetics in Singapore. But the main challenge is not with patients being cared for in the public sector, where the number being screened for diseases such as diabetic retinopathy and macular oedema have been increasing over the past three years, but the unknown number in private healthcare, especially at general practitioners (GPs). 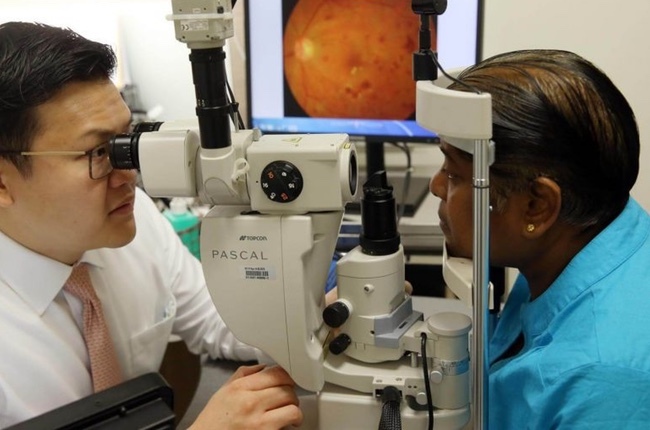 One hurdle for primary care eye screening here is that family clinics do not have the expensive retinal cameras that are needed, said Dr Gavin Tan, a consultant at the Singapore National Eye Centre's (SNEC) Surgical Retina Department. To help, MOH has put these cameras in the six community health centres located in estates such as Ang Mo Kio and Tampines since 2010, while SNEC helps with the reading of images. These centres were set up to support private GPs in managing patients with chronic diseases. GPs can refer patients to the centres for tests, and the results are sent back to the doctors. The authorities hope this will lead to improvements in eye health, as about 25 per cent to 30 per cent of diabetic patients have eye diseases such as diabetic retinopathy, cataract and glaucoma, said Dr Tan. The risk of developing diabetic retinopathy increases with poor glucose and blood pressure control, as well as the longer a person has diabetes, said Dr Su Xinyi, an associate consultant at the National University Hospital's (NUH) Eye Surgery Centre. "Diabetics are also twice as likely to get cataract and glaucoma compared to the general population," she added. Each year, SNEC sees about 28,000 patients in its diabetic retina clinics, of whom 40 per cent suffer from retinopathy - a condition in which weakened blood vessels in the retina cause vision loss. There are around 500 new cases of diabetic macular oedema a year, which is a complication of diabetic retinopathy. The weakened blood vessels leak fluid into the retina, causing distorted vision. More than half of diabetics have cataracts, which can be corrected through surgery, and fewer than 5 per cent have glaucoma. Detecting diabetic eye diseases early is key to treatment, said Dr Tan, hence the concerted effort in recent years to boost screening. "We have been very successful in the last five years in getting patients in the public healthcare system to get their eye screening," he added. MOH also started a primary care networks scheme last year to encourage GPs to organise themselves into networks - typically made up of 10 or more clinics - to provide team-based care for their patients. Networks can tap funding and administrative support from the ministry and the Agency for Integrated Care to hire staff, including nurse counsellors and primary care coordinators, or purchase services from external vendors. Networks provide services such as nurse counselling, diabetic retinal photography and diabetic foot screening. Despite screening services being readily available here, the fact that diabetic eye diseases usually do not show symptoms until the late stages leads to complacency, said Dr Jovina See, the clinical director of Shinagawa Eye Centre. "Unfortunately, when late complications such as secondary glaucoma have developed in the eye, the resulting blindness may be irreversible, even with treatment," she added. The ramped-up efforts aim to help patients such as Madam Ng Siow Kim, 56, be more vigilant. After suffering several falls three years ago due to blurred vision, she decided to get her eyesight checked and realised she had both diabetes and diabetic retinopathy. "I didn't go for screening because I thought I wouldn't get diabetes and was too busy with work," said the director of a metals manufacturing company whose condition has now stabilised after laser treatments. "But after finding out about the complications, I have become more cautious and am taking less sugar," said Madam Ng.